For years, millions of Salesforce users have leveraged out of the box operational reports and dashboards to quickly look up their data, understand performance and communicate results. However, with the amount of customer data volume growing exponentially every day, exploring data manually has become a bigger challenge, and analytics has become more important than ever before. It is impossible for anyone to spot every trend, understand every correlation or test every hypothesis by manual data exploration alone. 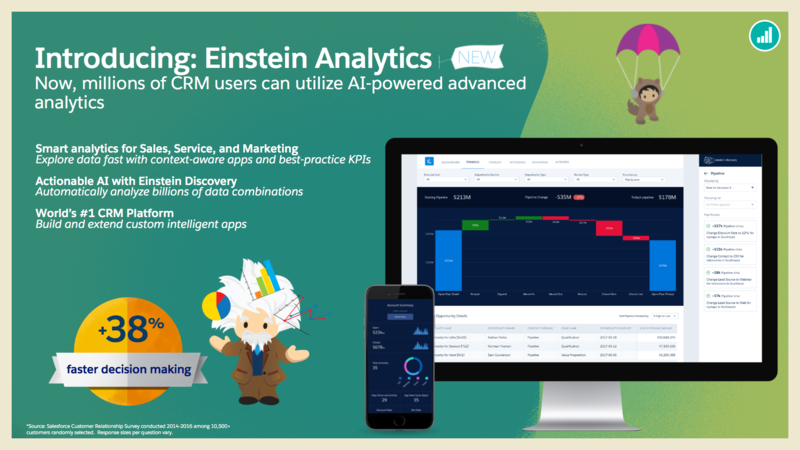 To address this challenge, today we are announcing the launch of Einstein Analytics so millions of CRM users will be able to utilize advanced analytics powered by artificial intelligence (AI). Now companies have a way to empower their sales reps, service agents, marketers and analysts with the insights they need to make every customer interaction smarter, without having to build mathematical models, write algorithms or ask an expert for help. Analytics apps for sales, service, marketing: Salesforce has revolutionized CRM analytics with role-specific, native analytics apps that break down the barriers to data accessibility, exploration and actionability for every Salesforce user. 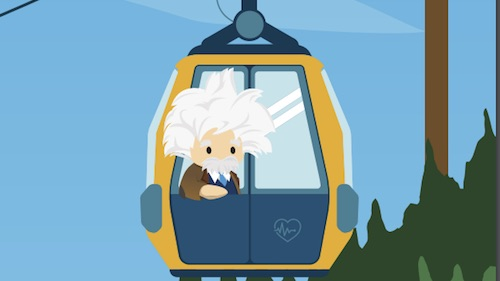 Einstein Analytics apps are pre-configured with role-specific KPIs built in Salesforce, providing users with an intuitive, self-service way to drill into the most up-to-date data, uncover insights, collaborate and take instant action from any device. Sales Analytics allows sales reps and leaders to manage forecasts, pipelines and team performance. Service Analytics enables service agents and call center managers to improve customer satisfaction, agent efficiency and channel optimization. B2B Marketing Analytics brings data-driven marketers insights on engagement, pipeline and campaign performance needed to take action. In addition, customers can also build and customize their own custom analytics apps on the Salesforce platform -- with the new analytics app designer, visual data prep and external data connectors. Actionable AI with New Einstein Discovery: Einstein Discovery conducts thousands of statistical checks to confirm each trend is valid, and also provides intelligent explanations for the patterns it identifies, delivered in easy-to-understand language. To complete the analytics workflow, Einstein Discovery offers guided recommendations on how to take action and even helps CRM users communicate its findings quickly with auto-generated slide presentations that contain visualizations and talking points. For example, the Sales Analytics app can analyze thousands of deals with Einstein Discovery, which can tell a sales manager the top three factors that have the greatest impact on closing a deal across products, regions, industries and more. Furthermore, because Einstein Analytics is not a black box, business analysts can access the complete model and algorithms behind the analysis to gain a deeper understanding of how the predictions and recommendations were derived. Community of Analytics Trailblazers: Salesforce is empowering everyone to develop analytics apps faster and together. With Trailhead, Salesforce's interactive, guided and gamified learning platform, anyone can become an analytics trailblazer today with 12 online learning modules. Additionally, with AppExchange, the world’s largest business app marketplace, ISVs can build and extend the power of Einstein Analytics to more roles, departments and industries, empowering all business users to be smarter about their customers with actionable insights. In fact, more than 20 analytics apps from leading ISVs are already available today on the AppExchange.